I have several pet projects in my fourth grade class and expanding vocabulary is one of them. To me, acquiring new words can be like a puzzle. If students learn some Greek and Latin roots and prefixes, they can begin to mix and match and gain access to a whole cluster of words rather than memorizing one definition. If students play with synonyms and antonyms, they can have a mental thesaurus, so they avoid “boring” words like said or nice. I am trying a new activity where students rank or qualify words from mild to extreme. Word Clusters: I created lists of related words, printed them on cardstock, and cut the words into strips. Visit my TeachersPayTeachers store to download the free activity plans. Word Envelopes: I used white coin envelopes and wrote the common theme or topic on the front. Some topic suggestions are light, heat, cold, hunger, anger, and happiness. Sorting: My local Lowe’s unknowingly donated a class set of paint chips to me. Students worked in pairs to rank the words in the coin envelopes from mildest to most extreme. Once they finished ranking, they copied their words onto the paint chips in order. They started with the most mild word on the light end of the paint chip and ended with the most extreme word on the darkest portion of the paint chip. 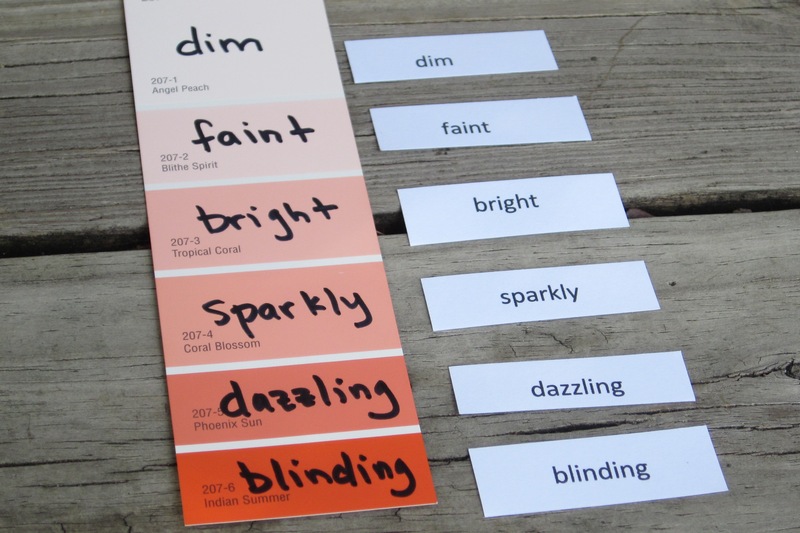 The paint chip allowed for six words. 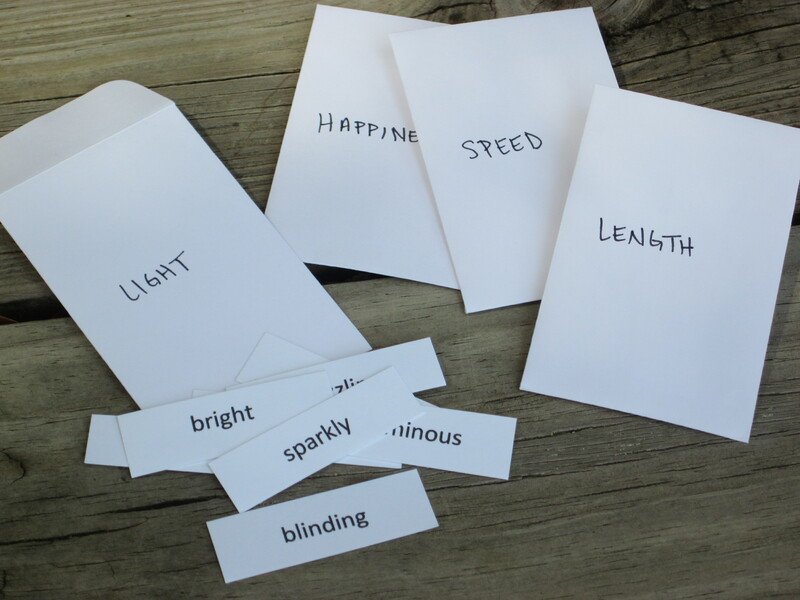 Some coin envelopes contained more than six words, so students were supposed to decide which words were less effective and eliminate the extras. WARNING: Some students simply eliminate the unfamiliar words, so they do not have to reach for a dictionary. 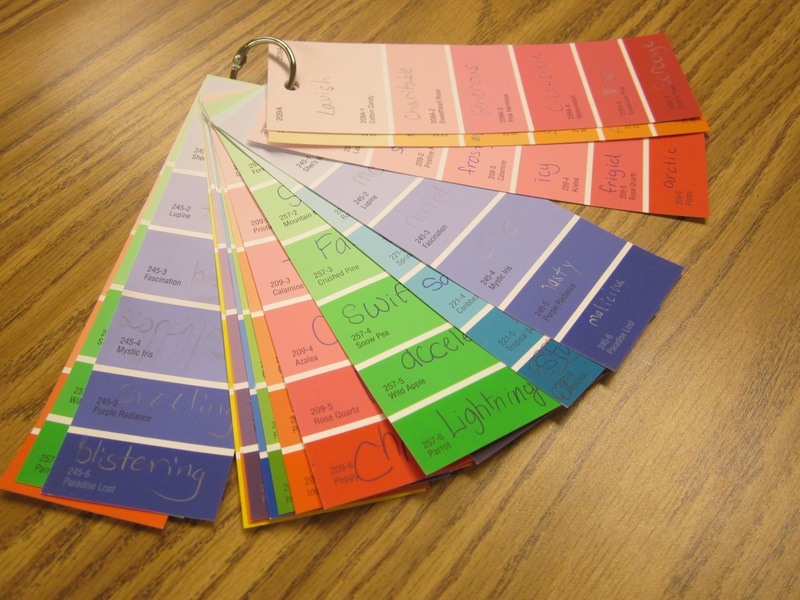 The paint chips will be displayed in the classroom, so students can use these while writing. Parents, if you are working with your child on a writing assignment at home and notice overused words, create a word rank chart. This is particularly helpful with said. Create a list of variations for said and rank them– whispered, murmured, squeaked, announced, screeched, screamed… Try it with very too! Extensions: This activity can be used to build analogies. You can also skip the step where you provide the main topic on the front of the envelope and ask students to create a heading for the words in the envelope. All of these activities require critical thinking on the part of the child. Click An InLinkz Link-up for more activity ideas! TERRIFIC ideas! I just attended a CCSS inservice where vocabulary development was the topic! Your ideas and suggestions are much better than what was presented there. Thanks for sharing! Thank you so much for the comment! I love hearing from teachers about what works (or won’t work). The word ring has worked very well for me this year. My students also have binder rings with common prefixes, roots, and words that go with them. We flip through them and practice them the way you would practice math facts. It’s very exciting when we see a word like “interstate”, and we can dissect it and decipher because we know the prefix “inter” and the root “stat”. I love this idea and plan to share it with my next door neighbor who teaches middle school. She loves hands on activities! And Lowe’s “donates” a lot to my classroom too! Thanks for sharing!! I found your link on Fonts 4 Teachers! I love this idea and look forward to using it with my son at home. Thank you for sharing! Thanks for stopping by. I do love this activity! Wonderful ideas! My daughter is homeschooling her children. She might appreciate these suggestions. Thank you for liking my blog! Please share! Thanks for the comment. What a great idea! 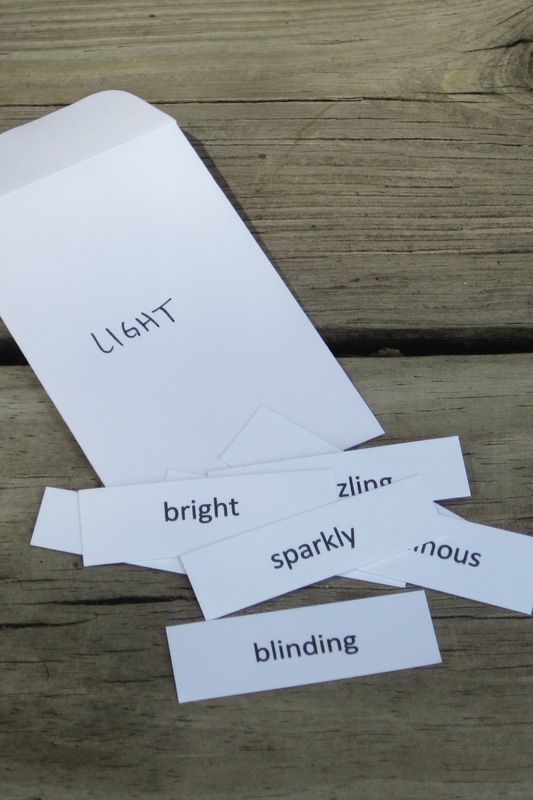 This would be fantastic to challenge students to have a broader vocabulary. I also like how kids have to think about degrees of words. A person can be furious or miffed- which choice is mild? Which choice is stronger? It definitely broadens vocab. Thanks for reading. I love this and will try it with my fourth graders this year!